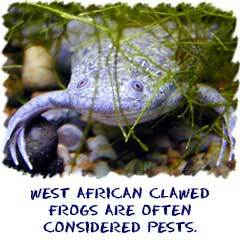 Most of the amphibians are slimy. They have a very good reason. Amphibians are the evolutionary step that happened when animals left the oceans and lakes and came on to land. Some fish (lungfish) can survive out of the water for a while, but amphibians were designed for it. One hitch: they need the water when they are kids. Amphibians also use their skin to absorb oxygen from the air. The absorption process is more efficient when the skin is moist all of the time. It's hard for us to explain what a frog or a toad is. It has four legs. Most amphibians also have moist skin (toads do not) for absorbing oxygen. They have extensions that are like fingers and toes. Like all amphibians, they have a three-chambered heart. We do want to tell you that frogs (and amphibians in general) are dying off. Since they have moist skin that helps them breathe, they are very vulnerable to poisons. Man's pollution is one of the deadliest poisons of all. As we create more pollution, the delicate way that amphibians breathe is being upset. They are slowly dying off. Unfortunately, they live in areas man may not be, so we will never know. 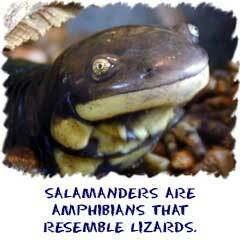 Salamanders are like frogs, but their body shape is more like a lizard. They are longer and have shorter legs. Often their bodies lay flat on the ground because their limbs (legs) are attached on the side of their bodies, not underneath as in mammals. You will often find salamanders around ponds and other small bodies of fresh water. Caecilians are wild. They look kind of like snakes but are actually amphibians that found an advantage in not having legs or feet. You might be thinking that doesn't sound like an advantage. You need to remember that when amphibians were the first creatures on land, there were no snakes. There was an entire ecological niche to be filled. Some amphibians evolved to slither along the ground and eat insects and worms. When you have a body like a snake you can get into tight spaces and find tasty insects for your lunch. Those slithering amphibians filled a specialized ecological niche that snakes filled millions of years later.